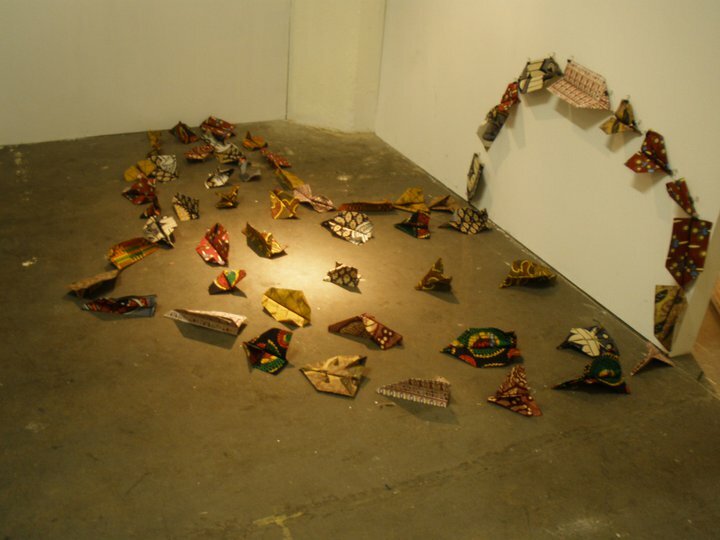 In his project Dispersing Planes II, Jabari continued his exploration of the African-American migration experience. Through a series of public interventions that took place at his local laundromat, Jabari collected laundromat patrons’ emigration stories. Ultimately, Jabari installed a myriad of similar planes in his laundromat and host a public convening for neighbors to share the circumstances or dreams that brought them to Brooklyn. Jabari Owens-Bailey is a visual artist and burgeoning curator who hails from Washington, D.C. He received a B.F.A. from Corcoran College of Art + Design in D.C. and an M.F.A. from the School of Visual Art (SVA) in New York City. As an undergraduate, Jabari was selected to study sculpture at the University of Georgia’s semester abroad program in Cortona, Italy. Jabari began engaging the public with his work while in graduate school with several performative actions. Jabari is currently a Curatorial Fellow at Museum of Contemporary African Diasporan Art (MoCADA), an Assistant Curator for Art in Odd Places, and maintains an active studio practice. He creates work in the media of performance, sculpture, print, installation, and video. His work generally deals with issues of identity, and absurdity simultaneously. Recently it is moving towards involving migrating cultures, particularly as it pertains to the African Diaspora.